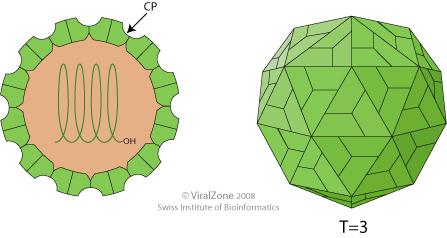 Non-enveloped, spherical virion about 23 nm in diameter with T=3 icosahedral symmetry composed of 180 CP proteins, with some percentage containing a readthrough domain (RTD) extension located on the particle’s surface. Monopartite, linear, ssRNA(+) genome of 5.3-5.7 kb in size with a VPg bound at the 5' end. There is no poly(A) tail or tRNA-like structure at the 3' end. The virion RNA is infectious and serves as both the genome and viral messenger RNA. 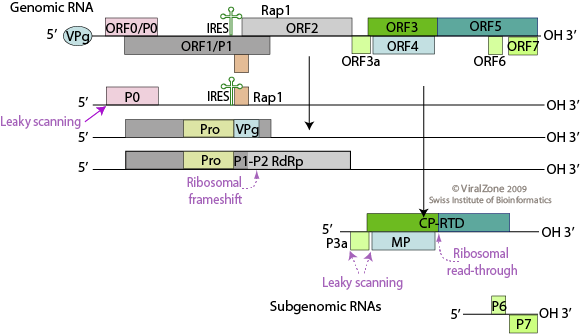 The polymerase is expressed by a ribosomal frameshifting near the end of ORF1. Rap1 translation initiates about 1500 nt downstream of the 5' end of the gRNA by an unusual internal ribosome entry site (IRES). The movement protein (MVP) and P3a are expressed by leaky scanning of the subgenomic mRNA. Suppression of termination of the CP stop codon produces CP-RTD (CP extended), the capsid subunit essential for aphid transmission. ASSOCIATED DISEASES PLRV causes prominent rolling of the leaves of potato and a stiff upright habit of the plants. There is necrosis of the phloem and accumulation of carbohydrates in the leaves.